The flag folding ceremony represents the same religious principles in which our country was originally founded. The portion of the flag denoting honor is the canton of blue containing the stars representing states our veteran served in uniform. The canton field of blue dresses from left to right, and only is inverted when draped as a pall on a casket of a veteran who has served our country honorably in uniform. In the evening, in the Armed Forces of the United States, at the ceremony of the retreat after taps have been sounded, the flag is lowered and folded in a triangular fold, and kept under watch throughout the night as a tribute to our nations honored dead. The next morning it is brought out, at the ceremony of reveille and run up aloft as a symbol of our belief in the resurrection of the body. The individual folds of our beautiful flag all symbolize the same religious principals that our great nation was founded upon. 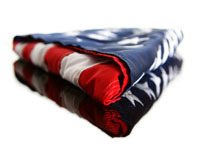 The third fold is made in honor and remembrance of the veteran departing our ranks who gave a portion of his life for the defense of our country to attain peace throughout the world not to have been in vain and shall never been forgotten. The fourth fold represents our weaker nature, for as American citizens trusting in God, for it is to him we turn in times of peace as well as in times of war for his divine guidance. The fifth fold is a tribute to our country, for in the immortal words of Steven Decatur, "Our country, in dealing with other countries, may she always be right, but it is still our country, right or wrong." The sixth fold is where our hearts lie - and it is with our hearts that we pledge allegiance to the flag of the United States of America, and the Republic for which it stands, one nation under God indivisible, with liberty and justice for all. The seventh fold is a tribute to the armed forces, for it is through these same armed forces that we protect our country and our flag against all her enemies, whether they be found within or without the boundaries of our republic. The eighth fold is a tribute to the One who entered into the valley of the shadow of death, that we might see the light of day, and this fold is made to honor Mother, for whom it flies on Mothers Day. The ninth fold is a tribute to our womanhood, for it has been through their faith, love, loyalty and devotion that the characters of the men that have made this country great have been molded. The tenth fold is a tribute to Father, for he too has given of his sons for the defense of our country, since she was born first. We fold from the stripes toward the stars, for whereas the stripes represent the thirteen original colonies that found our republic, and they are now embodied in the fifty sovereign states represented by the stars, so that the stars cover the stripes. The eleventh fold in the eyes of a Hebrew citizen, represents the lower portion of the seal of King David and King Solomon, and glorified in their eyes of God of Abraham, the God of Isaac, and the God of Jacob. The twelfth fold in the eyes of the Christian citizen, represents an emblem of eternity and glorified in their eyes God the Father, God the Son, and God the Holy Ghost. When the flag is completely folded, the stars are upper most, which reminds us of our national motto, " In God We Trust." After the flag is completely folded and tucked in, it takes on an appearance of a cocked hat, ever reminding us of the soldiers who served under General George Washington, and the sailors and marines who served under Captain John Paul Jones, and they, followed by their comrades and shipmates in the armed forces of the United States, have preserved for us the rights, privileges and freedoms which we are enjoyed today.